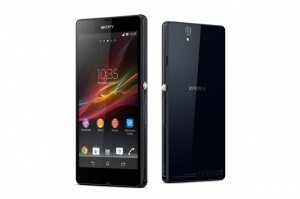 One of the most notable features of Sony’s new Xperia Z smartphone is that it will work under water for up to 30 minutes. You don’t have to worry about Sony’s newest flagship smartphone getting wet in a rainstorm. In fact the Android handset is both dust and water resistant — IP55 and IP57, specifically — and can survive the rain or even an accidental swim in your local pool. You can take it into shower and answer calls. And you can use in the bathtub for video watching also. Sony spent a lot of time bragging about its new 13-megapixel rear camera with “Exmor RS” built in. This technology will help when you’re taking pictures at night or in dim conditions. The 13-megapixel camera betters the offers from the iPhone and Galaxy as well as the Nokia Lumia and HTC One, offering HDR (High Dynamic Range) imaging during video recording, a feature the company claims is a maiden in the smartphone market. The 4G handset has a symmetrical, rectangular slab design with clean lines and flat glass panes to front and back, coupled with blunted edges and minimally rounded corners. A full HD screen (1920 x 1080) is complemented by a pixel density of 443 pi, making the Xperia Z ideal for watching films and TV programmes on the go. The Xperia Z’s rather sizeable screen belies the device’s relatively light weight of 146g, and at 7.9mm thick, is slightly thicker than the iPhone 5 but considerably slimmer than the Samsung Galaxy S3. The phone is powered by a 1.5GHz quad-core Snapdragon S4 Pro processor, has 2GB of RAM and comes with 16GB of internal memory. There’s also a microSD card slot for extra storage. Running on the slightly dated Android 4.1 Jellybean, the phone has nevertheless been slated to receive an update for Android 4.2 and the next installment of the platform which has been codenamed Key Lime Pie. Sony has wisely opted for a slimmed down user interface, getting rid of some of the widgets and functions that cluttered previous smartphone offerings. One of the more impressive features is the inclusion of a battery maximizing option, called Battery Stamina Mode. The feature prevents applications from running when the screen is locked, therefore saving power of the 2330mAh battery and apparently improving standby time “by at least four times”. Coming in three different colours – black, white and purple – the Xperia Z is still some way off being market ready but has been tentatively earmarked for release in March of this year, with an estimated retail price of around £450. The phone is initially expected to be available to Western Europe and is coming to Australia in March. Sony has struggled in the past to match the smartphones churned out by its rivals, the Xperia Z is being regarded as the company’s flagship, and you won’t have to worry about taking your phone out when it’s raining. What are your first impressions of Sony’s fresh new devices this year? Is it something you’d be interested in or is it not your style?